Ilo Organics makes the most luscious handmade organic soap & organic essential oil blends made with 100% pure organic plant extracts. 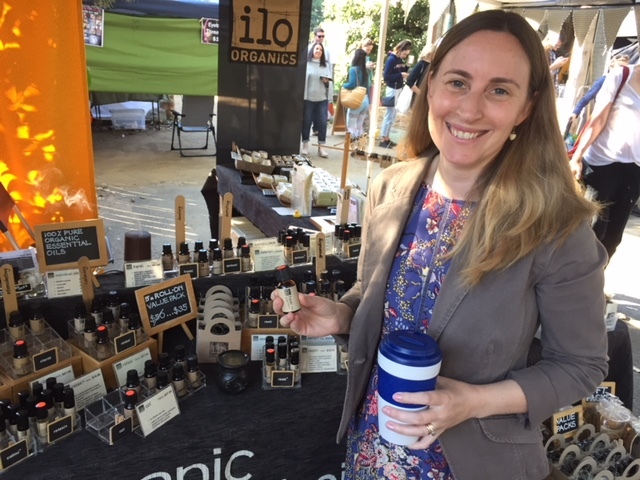 ILO Organics have been a valued stall holder at Northey Street Sunday Organic Farmers Market for about 8 yrs. They attend the market on the 1st, 3rd, 4th & 5th Sundays and share the space with Miessence on the second week. Anyone who’s health conscious, or struggling with skin issues should definitely try using Ilo Organics essential oils or soaps. Their soaps are very moisturising, naturally rich in glycerine. The selected organic plant oils offer various benefits to the skin. Ilo Organics intentionally limit the number of ingredients used, to reduce potential allergens/irritants. The skin is the largest organ of the body. What you apply to the skin gets absorbed by the skin directly into the bloodstream within 26 seconds. Most commercial soaps & body washes are made from petrochemicals &, as such, are detergent based & harsh. Our body was never meant to process petrochemicals and fragrance compounds can be one of the biggest irritants to the skin. ILO Organics soaps are chemical, colour & fragrance free. ILO Organics essential oil blends are made with 100% pure organic plant extracts. The blends are personal mixes and cover most lifestyle and wellbeing needs. They have done the hard work for you! They sell organic essential oils at very competitive prices, compared to USA big brand names. People don’t realise that those brands are NOT organic generally. There are no governing bodies in the USA and it’s estimated that only 2% of the essential oils sold there are even pure. There is no such thing as ‘therapeutic grade’ essential oil. This is a marketing strategy & registered trademark of the USA brand name companies. So please be aware when purchasing essential oils! You can trust ILO Organics, who make fantastic blends to assist with a range of issues including healing pain relief or headaches naturally with a ‘maxi’ blend of 8 essential oils. They also make oils to purify the air and a ‘defenci’, a blend of 5 essential oils, that is invaluable during the flu season. Essential oils can also be used to fragrance your body and your home with smells that will please you, ground you, stimulate you or clear energy. Trudy from ILO Organics loves direct contact with her customers, the interaction & conversations, and delights in those who come back and share their success stories from using her products. Trudy started making organic soap because her daughter, who has very sensitive skin and a yellow colouring allergy, had bad reactions to all the commercial products. So Trudy started making organic soap in order to control what the ingredients were. Then she discovered how much she loved making soap! She would be hanging out to make another batch and then decided to sell to others with similar needs to her daughter’s and ILO Organics was born! So for essential oils and soaps with 100% pure organic plant extracts, come visit Trudy at ILO Organics at Northey Street Organic Farmers Market. They’re products and a business name you can trust.